Absolutely love them! Worth the price! This is my second time purchasing this product and will be ordering more! I have not found better quality. Designed with energy-saving elegance in mind, this blackout curtain panel will enhance the look and feel of your favorite room. The panel features a rod pocket header for easy hanging, and is crafted from a lustrous blend of polyester and nylon for a soft feel and a high sheen that is available in a variety of rich colors. The blackout lining keeps the room dark and insulated against heat and cold, adding practicality to this sumptuous and stylish curtain panel. Ordered these in Robins Egg, in the picture they are a little lighter but you have to know that this photography is done under very bright white light which will give them a lighter appearance. I would say they are a Soft Teal Blue and depending on light/wall color will appear lighter or darker. Overall the Quality is exceptional, these came in with Pinch Pleated Hooks which was so helpful and much appreciated. They block out the light completely, nice black felt lining inside covered with crisp White Cotton. They also have light weights at the bottom of the panel which keeps the drape looking great. I would say, expect the color to be closer to the shadowed part of the Drape that you see in the pic, this is at least for Robins Egg. These curtains are very shimmery and pick up other colors in the room. I think they're beautiful but if you don't like really shiny curtains these may not be for you. I tried hanging them w/ clips but that looked awful so I used the rod pocket instead. My only complaint and the reason they only got 3 stars is- there is extra lining down the sides (in between the outer curtain and lining) and one side of each curtain is twisted, the way it's sewn in is not an easy fix so they are not hanging correctly. I haven't tried it yet but I'm hoping ironing will fix it. They are not completely black out but do block most light. Stunning quality, although the gold nugget is really more of a warm, dark khaki brown. It's kind of a very dark antique gold. Beautiful, rich color with a lovely sheen, but not shiny or tacky! Weighted, lined, well sewn. My only caution for you is that be aware that the top "rod pocket" is sewn such that the rod will sit at the very top of the drape. There is't any seam sewn to hold the drape so that there's a couple of inches of fabric above the rod. I used this in a guest room coordinated with Tommy Bahama Palmier bedding and it works very nicely. Can't beat the price! Great material but be careful on color choice! I've been buying from Overstock for years now, but haven't done any product reviews yet. With this purchase, I really wanted to be sure I provided feedback since I am disappointed with this product. While I love the material, the color of the panels I received was way off. The color I selected was Vintage Gold, and what it looks like is Olive Green. Not only do I really not like green, but it was a major mismatch to everything in our house (we have a Contemporary style with bronzes, golds, red, cream, colors,etc) Just awful! Now I am stuck with having to return these and hope that the next selection will match as the picture showed, or just move on. Too bad, since the quality was good. This curtain is extremely heavy and looks high quality, at a fraction of what you would pay from a custom outfit like Smith & Noble or the Curtain store. I would purchase again in a minute. I absolutely love these curtains! They have a sheen about them that portrays various colors. They are thick and keep the room dark while trying to watch a movie during the day and also look great from the exterior of your home as well. These curtains look amazing! I had to steam them to get all of the wrinkles out, and it made such a huge difference. They are the perfect amount of shine to look luxurious instead of cheap. They are made well and have a nice lining. Love the fabric! Awesome curtains! Cheap quality fabric and mushroom color is super extra way too dark. More like chocolate. Finery; that I always expect, from Exclusive Fabrics! I got 2 lengths. The one size was beautiful and I would have given 5 stars,. However I just went to hang the 120 in drapes and they are not sewn correctly on the side seams! Won't hang straight and there are no more in the color that I need! So disappointed. Now I understand why 2 of them were an obvious return from someone else! After steaming, they are beautiful. They look very expensive. I am very pleased with my purchase. Very nice fabric and very well made. Great lush color. Looks like they were much more expensive that what I paid. I love these curtains. They definitely keep the sunlight out and keep the room warmer in winter and cooler in summer. Big plus?- Tgey look luxurious after you iron them! 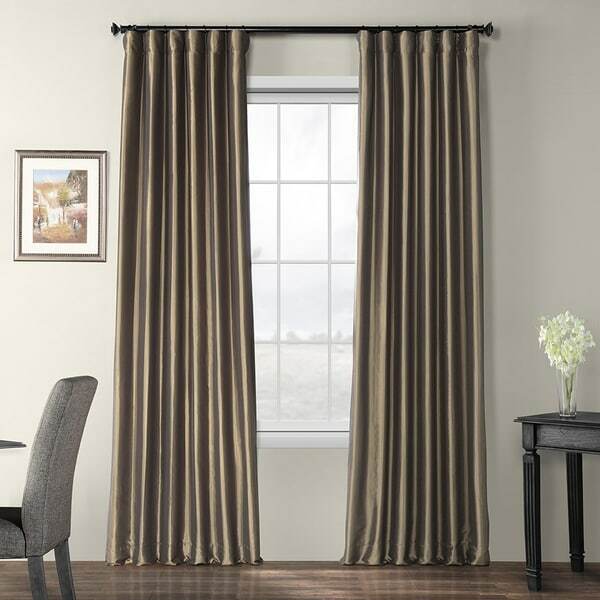 love these drapes very much - they look really expensive and are great room darkening option! Love the look!! Excellent room darkening..
"What color is the back side of the curtain "
The visible blackout lining is a cool beige. "how close does the robin's egg color match the aqua Crystal Palace Paisley 300 Thread Count Cotton Sheet Set?" Unfortunately we are unable to confirm this. We apologize for any inconvenience we might have caused. I wanted to create the same look from a photo in a home interiors magazine. The material and color looks like a match. "Which is darker, the Copper Brown or the Rum Raisin? They look the same when you click on each color? Looking for a darker brown. Debbie D."
Hello Debbie D., we appreciate your inquiry. The Copper Brown is slightly darker. We hope this information has been helpful.Thank you for shopping with us!